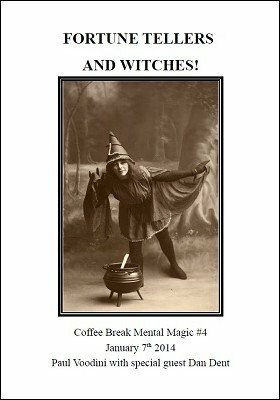 This is the fourth release in the Coffee Break Mental Magic series and features two very special routines plus for the first time, a short story on a magical theme! Paul Voodini presents the Story Teller's Oracle. This is a dice based reading system that is totally original and works in a way that has perhaps not been explored before. The system is pleasingly easy to master meaning memory work is kept to a minimum (no need for hidden cribs or sheets of numbers! ), all of which allows the performer to concentrate on presentation, atmosphere, and engaging the sitter. Paul is also delighted to welcome English-born, Switzerland-based mentalist Dan Dent into the Coffee Break Mental Magic fold. In this edition Dan presents his wonderful Tarot card routine 'The Witch Trial'. This is a great routine and ideal for those who are looking for ways to incorporate magical looking Tarot cards into their mentalism and mental magic. Finally this week's edition also includes a short story on a magical theme, totally in keeping with the two routines mentioned. All-in-all this makes Coffee Break Mental Magic #4 the perfect read for all magicians and mentalists on a dark, windswept night! And all for less than the price of a cup of coffee! This issue of the series is the most magazine-like, in that it contains a variety. 'The Story-Teller Oracle' is a way of using two ordinary dice to make a simple reading. It has similarities to his own '3 Coins 4 Your Thoughts' ebook, though it's not as strong. But Voodini does open up many interesting possibilities here. 'Witch Trial' is a routine from Dan Dent. It is a story routine using tarot cards which fits quite nicely with Voodini's style. The ebook ends with a short story, 'The Vampire Fortune Teller', which proves that I would enjoy reading a collection of his fiction. It offers a modern fable, where Voodini draws us, however briefly, into an engaging world of a parallel Victorian London. Another encouraging entry in this fun series.